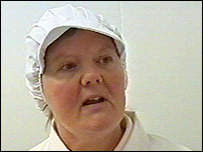 A farmer's wife who started a cheese-making course by accident now produces the most expensive cheese in the UK. 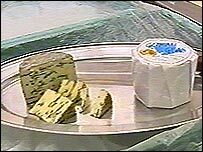 Margaret Davies from Anglesey sells her award-winning blue-veined cheese at £27 per kilo - about double the price of most cheeses. Gorau Glas is a soft cheese made with milk from the family's dairy farm near Dwyran. The British Cheese Board has confirmed it is the highest-priced variety made in the UK. Mrs Davies produces the cheese at Coleg Menai's Food Technology Centre in Llangefni, where she got her first taste of the cheese-making business. "It all happened by accident," she says. "My son enrolled on the cheese-making course at Coleg Menai but was unable to make it. "So I went along and really got hooked!" Launched at an agricultural show in Anglesey last year, the cheese has since won a British Cheese Awards gold medal. Mrs Davies has now been selling the cheese for 12 months to top restaurants around the UK as well as local buyers. It takes her six weeks to produce 100 truckles and she says the cheese has such a high price because it is made to the best standards possible. "Its got the best ingredients and the process is very labour intensive. "People come back for more. "It's selling well to local people and restaurants - people are willing to pay for quality these days." Deiniol ap Dafydd from Llanrwst-based delicatessen, Blas Ar Fwyd, says he stocks the cheese because of its high quality. "It is a blue cheese made to a high standard - not only the standard of the milk but the production method is high quality too. "It is made in small batches and like anything else that is produced like that, with care, it will be better." However, some local retailers feel the price is too high. Beaumaris delicatessen owner, Sarah Walczak, stocks up to 100 different types of cheeses and says that Gorau Glas is too expensive. "Very nice Welsh cheeses such as Llanboidy and Llangloffan can be bought for £14 per kilo and the most expensive cheese I stock is Roquefort at £19.90 per kilo," she said. "Although Gorau Glas is a very nice cheese, I think it is overpriced unfortunately."